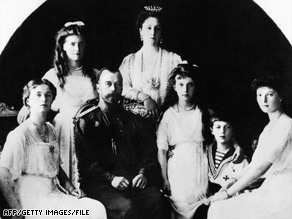 (CNN) -- One of the most enduring mysteries of the 20th century has been put to rest: DNA analysis of bone fragments has proven that two of Czar Nicholas' children believed to have escaped were killed with their royal family during the Russian Revolution. Czar Nicholas II, from left, daughters Olga, Maria, wife Alexandra, kids Anastasia, Alexei and Tatiana in 1917. The chemically damaged and burnt remains were found in the Romanov family's makeshift grave outside the city of Yekaterinburg, Russia, in 2007. In 2008, scientists used bone and tooth fragments to identify the remains as those of the two missing children of Czar Nicholas II: 13-year-old Crown Prince Alexei, the emperor's only son and heir to the throne, and his sister Grand Duchess Maria, about 19. Researchers wanted to confirm their findings by comparing DNA from the remains with that of living Romanov relatives. The results of the DNA analysis were published online Tuesday in the journal PloS One. The Romanov family, the last Russian monarchy, was executed in 1918 by Bolsheviks in the basement of a home in Yekaterinburg, about 900 miles (1,448 kilometers) east of Moscow. Several of their staff members and servants also were killed. Nicholas' reign had ended when he abdicated the throne in 1917 at the time of the Russian Revolution. The remains of the family were discovered in 1991, during the last days of the Soviet Union. In 1998, those remains -- of Nicholas, his wife, Alexandra, and three daughters -- were interred in a cathedral in St. Petersburg that contains the crypts of other Russian royalty. At the time, many thought that Alexei and Maria might have escaped -- leading to hopes among royal supporters that one or both Romanovs were still alive. But clues left by one of the family's assassins led investigators to the grave where the remains of Alexei and Maria were unearthed in 2007. The drama surrounding the Romanovs has been the subject of many books, movies and documentaries. Several women have claimed that they were Anastasia, Nicholas' youngest daughter, contending that they escaped the executions. The body of one impostor, Anna Anderson, was cremated when she died in 1984. DNA tests showed she was not related to the Romanov family.